Outlook™ India, widely acclaimed as the best platform for key nonwoven professionals in the personal care and hygiene products just closed in India on a very successful note. 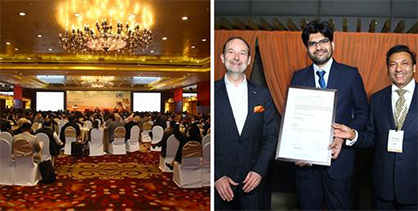 Outlook™ India was the first ever platform of this scale and took place in India on the 12th and 13th of February 2019 in the Leela Ambience Hotel in Delhi NCR. The participants learnt and shared insights on the exciting market potential of India, whilst taking this unique opportunity for networking and doing business. Organised by EDANA and BCH, who have been partners for 12 years, Outlook™ India 2019 was the first ever edition of EDANA’s flagship conference, which has so far been organised 17 times in Europe, 3 times in South-East Asia and twice in Latin America. More than 320 delegates from over 152 companies were in attendance for the opening keynote presentation made by the Unicharm President & CEO, Mr. Takahisa Takahara on ‘Ideas for circular hygiene products for now and the future’. The second day opened with a keynote speech from Mr. Ashish Jajoo, Global Sales & Marketing Head at Birla Cellulose Nonwovens Division on ‘Bio based solution for wipes and the hygiene industry’. Other sessions featured expert insights on market trends and presentations on the latest innovations and technologies pertaining to the absorbent hygiene industry. One of the red threads of a majority of presentations was the absolute necessity for the whole industry to address the key concerns of the times, sustainability and circularity. The table-top exhibition provided 30 companies with the opportunity to showcase their products and services to a captive audience. “The response of both the Indian and international industry participants to BCH’s and EDANA’s initiative has been overwhelming” said Pierre Wiertz, General Manager of EDANA, “the enthusiasm and the eagerness of the whole supply chain to capitalise on the huge potential market opportunities for absorbent hygiene products in the whole sub-continent gives both organisations even more responsibility in supporting this, so that it remains a sustainable and rewarding growth. We are definitely committed to pursue this as part of our missions”, he concluded on. Ritika Gupta, Executive Director of BCH further said that “Outlook™India seemed as wonderful platform and became a ‘cause’, the positive ‘effects’ of which will be surely witnessed by the promising Indian absorbent hygiene products industry. At a time when a majority of Indian consumers are at the brink of being introduced to these products, it was interesting to hear about the latest that the world has to offer. India may become a trend setter as market penetration of disposable hygiene products increases”. The Outlook™ India Innovation Award was attributed by delegates’ votes to Saral Design Solutions for their fully automatic machine technology SWACHH that produces affordable, ultrathin sanitary napkins at a decentralised set up. Kartik Mehta, co-founder and CTO of Saral Design solutions who was honoured by the recognition said “BCH and EDANA have done a tremendous job in conducting Outlook India 2019 and bringing together all players in the hygiene industry for networking and knowledge sharing. We are very humbled to be receiving the Outlook India innovation Award 2019. It has provided a platform for start-ups like ours to present our innovations to all stake holders of the hygiene industry globally ». The other two companies shortlisted for the innovation award were Fibril Tex, with the DAC (Dynamic Absorbent Core) an innovative well-structured inner core for absorbent hygiene products and H.B. Fuller with the Full-CareTM6210, an adhesive solution for sanitary articles responding to the two challenges, one of the subcontinent climatic conditions and the second of the wearing of pads for extended periods of time.